It’s the cliché college scene: a dorm room decorated with pizza boxes, poorly hidden beer bottles and candy. Ramen is practically currency, and Ben & Jerry’s is the stand-in therapist. 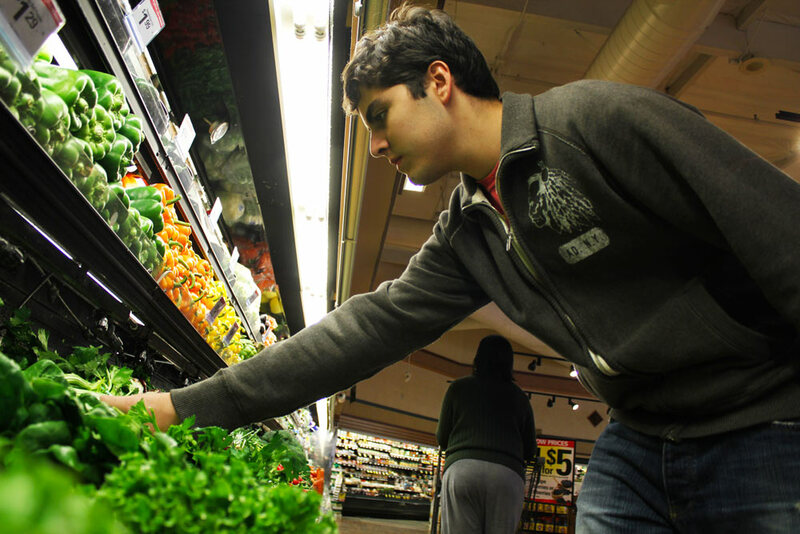 College students aren’t particularly known for their healthy eating habits. But to dismiss the advantages of decent nutrition is silly: Good food keeps your energy up, your skin clear and certain — ahem — activities more regular. Don’t be afraid to fight the truism. Eating healthy in college is easy, regardless of whether you shop at Safeway or Subway. Cooking is the best way to control nutrition — you call the shots, ingredients and portions. And for those whose kitchen expertise ends with the microwave, college is the perfect time to learn. An easy way to start is online. Websites like Eating Well and Oregon State’s Healthy Recipes provide a bevy of recipes to get you started. Cook This, Not That!, a men’s health publication, is an excellent primer for the kitchen newbie, as is Mark Bittman’s behemoth How To Cook Everything. And don’t feel limited to health foods. Any recipe can be tailored to be as decadent or healthy as you desire. Take, for instance, macaroni and cheese. It can be a gut-buster or a yummy and remarkably reasonable side. Swap cream for milk; trade some of the regular cheese for cottage cheese; replace refined flour pasta for whole wheat, quinoa or rice pasta. The result is a dish with more protein and fiber and fewer calories. No need to swap in fat-free cheese, either — that stuff is gross and doesn’t melt right. Just don’t eat the whole pot. When Mom said to eat your veggies, she was right. Vegetables fill you up and supply vitamins. Since you now rule the kitchen, cook the ones you like. For the ones you don’t like, roast them in the oven, add chopped bacon and then reassess your opinion. Other ways to cook healthy without making gourmands cry is to pick tasty swaps. Protein-rich Greek yogurt can replace sour cream in many recipes. Mustard-based dressings require less oil because the mustard acts as an emulsifier. Corn tortillas are higher in fiber and lower in calories than flour ones. Good eating is not necessarily about cutting calories. Everyone needs vitamins and minerals, and they aren’t found in a bowl of frozen yogurt. Strapped for cash? Cooking saves money. To further tighten the belt, choose foods in their most unprocessed forms. For example, a whole chicken is much cheaper than individual breasts and provides more portions. Break out a slow cooker or stock pot and create delicious soups that trump Campbell’s. Cooking also cultivates a greater respect for food. It’s not just something to wolf down during Modern Family, but something to savor. Chewing, instead of hurriedly washing food down with iced tea, helps too. But students are very busy. Between calculus classes and video games, sometimes there’s just no time to cook. In that case, it’s time to tackle eating out. With some quick thinking, you can still sneak in all your favorite indulgences. Say you’re craving a hamburger. Ride forth and claim your meaty grail — but swap the fries for a salad this time. Booze or dessert? Bread or an appetizer? Beans or rice in your Yorkie-sized burrito? It’s all about priorities. And if you just want everything, adjust for that by decreasing portions across the board. Many restaurants today dish up giant serving platters worth of food. Your mom isn’t around — you don’t need to clean your plate. In fact, you probably shouldn’t: Science has proven most people eat with their eyes and not their stomachs. Add a few margaritas and disaster is brewing. The easiest answer is to take some home for a quick lunch the next day. You save time, money and your waistline. Everybody wins! Except cellulite. Another rule of thumb for healthier restaurant questing is to pick places with fresher food. Chick-fil-A’s nuggets are meatier and less breaded than McDonald’s. Lemonade creates gorgeous veggie and meat dishes, not limp-lettuce salads that smell like plastic. For those with extra cash, check out some of Los Angeles’ popular restaurants like Animal, Sugarfish and Real Food Daily. Their selections are natural and tasty and offer some culinary adventure. Finally, good eats are only part of the health puzzle. Stress and sloth can wreak just as much havoc. Getting more sleep, moving around and eating well are all key factors for staving off the college blues.